From the creators of Before After comes another striking book of opposites, this time exploring the concepts of within and without with bright, bold graphics. Safe inside its shell, a baby bird prepares to brave the world. A spelunker descends into a wide and glittering cavern while fellow explorers cluster around a crack in the earth. Fire-red ants march busily around their anthill, oblivious of a hungry anteater waiting above. Smart and stylish, this oversize art book takes a unique approach to the concept of inside and outside, offering clever and unexpected examples that will delight readers and spark conversations about context and perspective. 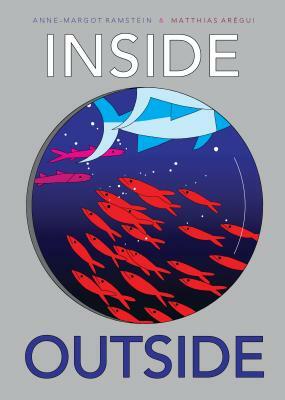 Inside Outside is sure to find a place in collections, on coffee tables, in classrooms, and anywhere curious minds can be found. Matthias Arégui studied illustration at the School of Decorative Arts in Strasbourg, France. He created the picture books ABC des Tracas and Before After with Anne-Margot Ramstein. He lives in France. Anne-Margot Ramstein studied art in Paris before joining the School of Decorative Arts in Strasbourg. She created illustrations for ABC des Tracas and Before After with Matthias Arégui as well as the children's book Les Illuminations D'Albert Einstein. She lives in France. As they did in Before After (2014), Arégui and Ramstein invite viewers to investigate concepts by moving back and forth through their colorful, dynamic world...Sure to provoke conversation, a fresh approach to looking, and multiple readings.